Kybella® (deoxycholic acid) is the only FDA-approved, non-surgical injectable treatment that destroys moderate to severe fat cells. This treatment can eliminate unwanted fat from your double chin, bra fat, and help contour the jawline by reducing jowls. 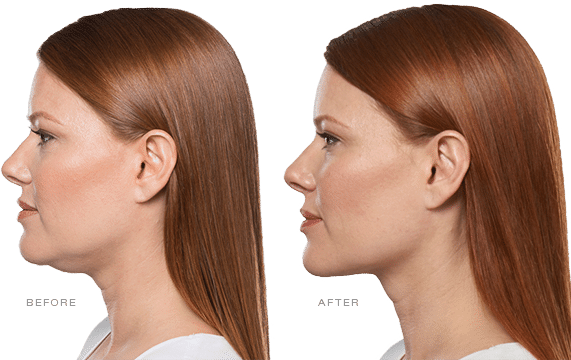 Kybella®, used to eliminate submental fat in adults from weight gain, aging, and genetics. Kybella® injections contain a naturally occurring substance in the body, deoxycholic acid, which is known to help the body absorb fat cells. This medically prescribed treatment is an alternative to liposuction or surgery, most commonly, to treat double-chin fat. Kybella® injections contain deoxycholic acid, which naturally occurs in the body, which aids in the breakdown and absorption of dietary fat. When Kybella® is injected into the skin, it destroys fat cells, resulting in a noticeable contour of the area. Once eliminated, these cells can no longer store or accumulate fat, so further treatment is not needed once you reach your desired aesthetic goal. Kybella® injections should be administered by a trained and licensed health care specialist. During each treatment, you will receive multiple small injections in the treatment area, which will take 15 to 20 minutes. The number of small injections you will receive depends on the amount of fat in the area and your desired look. During your initial consultation, you and your healthcare specialist will determine how many treatments you need based on your submental fat. Kybella® treatments should be given at least 1 month apart, and you should not receive more than 6 treatments. After your treatment, you will likely have some swelling, bruising, or numbness. Be sure to inform your healthcare professional if symptoms get worse. The cost of the injections not only covers the cost of the Kybella® treatment but the expertise and qualification of the administering functional medicine healthcare professional. Kybella® injections are highly sensitive, so looking for a qualified, functional medicine professional to administer the treatment is an important factor when looking at cost. Be aware of unlicensed people using unlicensed Kybella® and risking your body. When looking for a qualified professional, be sure to ask plenty of questions and make sure you feel comfortable with them performing the procedure. Remember the results are difficult to reverse if you get unlicensed Kybella® or use an unlicensed professional. To find out more, visit our office in Tampa, FL and meet with our functional medicine specialists or click here to send us a message. Alternatively, you can call us at 813-445-7770. We look forward to helping you get rid of unwanted fat!